I have a prediction: Sooner than you might think, this will be a vegetarian world. Future generations will find the idea of eating meat both morally absurd and logistically impossible. Of course, one need only look at the booming meat industry, the climbing rates of meat consumption in the developing world, and the menu of just about any restaurant to call me crazy. But already, most people know that eating red meat is bad for their health and harmful for the planet. It's getting them to actually change their diet that's the hard part -- and that's exactly why it won't happen by choice. Going by the numbers, eating meat is pretty hard to justify for the even moderately health-conscious. A National Cancer Institute report released last March found that people who ate the most red meat were, as the New York Times put it, "most likely to die from cancer, heart disease and other causes." The biggest abstainers "were least likely to die." Those who eat five ounces of meat daily, (the equivalent of one and a half Quarter Pounders or Big Macs) increase their risk from cancer or heart disease by 30 percent compared to those who eat two-thirds of an ounce daily -- a stark difference. The environmental impact is also crystal clear -- and similarly appalling. "Livestock's Long Shadow," a 2006 report by the United Nations' Food and Agriculture Organzation (FAO), found that livestock is a major player in climate change, accounting for 18 percent of all greenhouse gas emissions (measured in carbon dioxide equivalents), or more than the entire global transportation system. Rethinking the Global Meat Industry," a report by Danielle Nierenberg at the Worldwatch Institute. The study's author is herself a vegan, but she told me, "Food choices are a very personal decision for most people. We are only now convincing them that this is a tool at their disposal if they care about the environment." She has a point: Giving up meat is tough, and arguing people into it is probably a losing proposition. Even with all the statistics out there about the dangers of meat, there are fewer vegetarians in the world than you'd think. A Harris poll conducted in 2006 for the Vegetarian Resource Group found that only 2.3 percent of American adults 18 or older claim never to eat meat, fish, or fowl. A larger group, 6.7 percent, say they "never eat meat," but often that means they only avoid the red kind. Worldwide, local vegetarian societies report high participation in just a few places - for example, 40 percent in India, 10 percent in Italy, 9 percent in Germany, 8.5. percent in Israel, and 6 percent in Britain. So how will we become a vegetarian planet? The numbers suggest that we won't stop eating meat simply because it's "the right thing to do." People love it too much. Instead, we'll be forced to stop. By 2025, we simply won't have the resources to keep up the habit. According to the FAO report, 33 percent of the world's arable land is devoted to growing crops for animal feed, and grazing is a major factor in deforestation around the world. It's also incredibly water-intensive. The average U.S. diet requires twice the daily amount of water as does an equally nutritious vegetarian diet, reports the Worldwatch Institute. Meanwhile, there will be more than 8 billion people on this earth, and two-thirds of the world's population will live in water-stressed regions. Sounds like a mess -- and one that doesn't bode well for our cattle cravings. Meat will disappear -- except as a luxury available to few -- and the ethical issues will evolve, too. In the way that slavery, once a broad social norm, later became an unthinkable crime, we can expect to see a similar shift once meat-eating disappears from our planet. Perhaps, some day, the very idea of eating animal flesh will seem as remote as the idea of owning humans does now. So if you're a carnivore, enjoy now -- before the inevitable vegetarian revolution begins. According to the U.S. Department of Agriculture, the number of animals killed for food in the U.S. this year is expected to drop by six per cent from 2008. Eating Animals by Jonathan Foer and two other vegan books have made the bestseller list. The meat-industry exposé Food, Inc. is being considered for an Oscar nomination. Cargill, ConAgra, and other animal butchering empires have launched a number of vegan food products. The U.S. National Cancer Institute reported in March that people who ate the most red meat were "most likely to die from cancer, heart disease, and other causes." The American Dietetic Association affirmed in July that "vegetarian and vegan diets are healthful, nutritionally adequate and may provide health benefits in the prevention and treatment of certain diseases." Two World Bank scientists claimed in the November issue of World Watch magazine that meat production might account for more than half of man-made greenhouse-gas emissions. Isn’t it time for you to go vegan? It makes perfect sense. March 2011: The UN Food and Agriculture Organisation estimates that a staggering 60 billion animals are killed annually for human consumption – the equivalent of about nine animals for each human being on the planet. Total for 2009- 59,312,685,175. Unethical, unnecessary, and a huge impact on the environment. FAO data does not include deaths from hunting or fisheries, but fishery info (both farmed and caught by industry) is given for 2008 totalling 142,287,124 individuals. However this doesn't include bycatch, which also kills birds, mammals, and reptiles as well as non-target fish and invertebrate species. In 1994 FAO released a document which estimated that an average of 27 million tonnes of dead fishes per year were thrown back into the sea as bycatch: Potential marine mammal discard mortalities ranging from 65,000 to 86,000 animals annually. The UK's Scientific Advisory Committee on Nutrition recently recommended people aim to consume less than 70g per day of red and processed meat. Meanwhile, Canada’s federal, provincial and territorial Ministers of Agriculture announced last month that 19 provincially inspected meat packing facilities will take part in a pilot project designed to enhance interprovincial meat trade. Agriculture Minister Gerry Ritz stated, Breaking down trade barriers at home and abroad will yield greater returns for our meat industry and benefit all Canadians. And whether we like it or not , Canada's biggest domestically-owned beef packing firm will get $1.6 million in government grants toward new systems expected to help double its ground beef processing capacity at Brooks, Alta. Taxpayer dollars being used to encourage growth in meat sales, production and consumption – yet another example of industry and politics working together. Predictably, Health Canada is playing a strong supportive role in retaining out-of-date policies and guidelines with regard to supporting the consumption of meat and animal products. All of us should be moving toward a modern, healthy and compassionate lifestyle of veganism. June 2011: More and more people across the board today are enjoying the benefits of a healthy plant-based diet. The China Study and The Engine 2 Diet are two books that have prompted changes in our eating habits. Forks over Knives is a documentary that examines the profound claim that most, if not all, of the so-called “diseases of affluence” that afflict us can be controlled, or even reversed, by rejecting our present menu of animal-based and processed foods. Study after study confirms this truth. Rather than creating and developing new drugs to combat disease that is largely caused by diet and lifestyle, it is time to address the causes directly. The meat industry's rampant and systemic abuse of animals, the environmental degradation, air and water pollution, world hunger, slaughterhouse cruelties, and countless other reasons should convince you to make the switch. We all win. The Rabbit Advocacy Group will have an information table at Veg Fest Vancouver June 19th. World Weeks for the Abolition of Meat (WWAMs) will be at the Paris Veg Fest June 11th. Worldwide, six million sentient beings are killed for food every hour. The number of water animals killed is even greater. 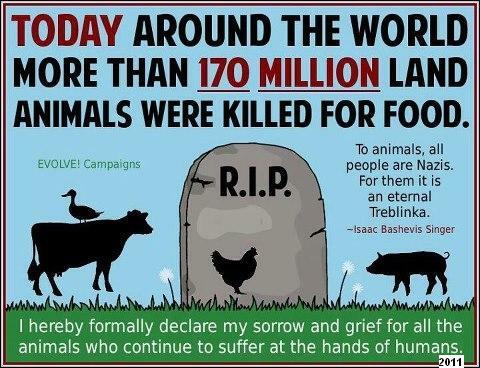 Meat consumption causes more suffering and deaths than any other human activity although it is completely unnecessary. Individuals from all walks of life are becoming more aware of this, and are mobilizing and organizing to help create change for society’s animals.